A study in versatility and functional fashion, the SCOTTeVEST Revolution Plus Jacket features 26 pockets to securely store and organize all of your gadgets and daily essentials. With its insulated, quilted lining our customers recommend the Revolution Plus for cold weather daily wear, travel, outdoor adventures and more! With the Revolution Plus, you will always be prepared for changing weather conditions - the adjustable and detachable hood can be rolled into the collar for storage or zipped off and stored in one of the pockets. 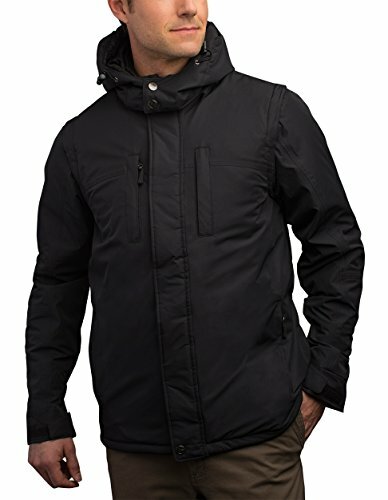 The water-resistant fabric and magnetic wind-flap (over the main zipper) will help keep you protected on those snowy and windy days. Plus, the sleeves are removable, so you can wear it as a jacket or a vest as temperatures fluctuate. CONVERTIBLE CLOTHING - features zip-off sleeves to convert from jacket to vest and back in seconds. Ultimate versatility!